rabbinic figure. Wedding sermonizes, divorces, circumcision, est. were all the function of the Chazan. Note: There are regular scheduled tours of the cemetery, call the Mikveh Israel office for schedule. The priests shall bless Israel. with the songs of Israel. 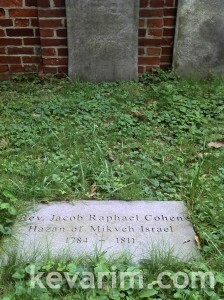 (February 1841) and was buried with his fathers. Canada, butied was his father Jacob Raphael Cohen who was first Rabbi in Canada. Abraham married Sarah Jeanett Picken, whose mother was an English aristocrat who eloped to America (Manhatten) with Andrew Picken. SJ wrote a book, Henry Luria, which you can get from google books for about $8.00. After their son Henry Luria (after whom the book is named) died at about 8 years old, the couple divorced. ONe of their daughters remained Jewish and the other three became Anglicans.